Extralight tempered glass high table, low table and screen with a special checked decoration on double-sided mirror or in tempered bronze glass (without decoration). Two perpendicularly checked crystals are applied to a double-sided silver shiny polished aluminum frame separated by a gap of a few centimetres. These objects create a game of mirrored reflections, coverings and transparencies that deceive the observer, dissimulating and confusing the objects reflected from the ones screened and vice versa. The screen is made of hinged modular panels. Tables have cylindrical supporting legs with the same finish as the aluminum frames and attached by an interlocking system. 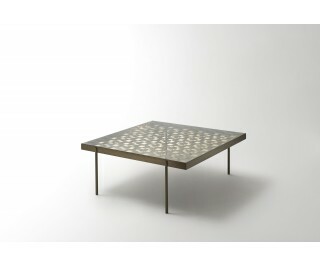 Alongside the extralight glass and silver shiny polished aluminum version, the tables are available in bronze glass and bronze anodized brushed aluminum.